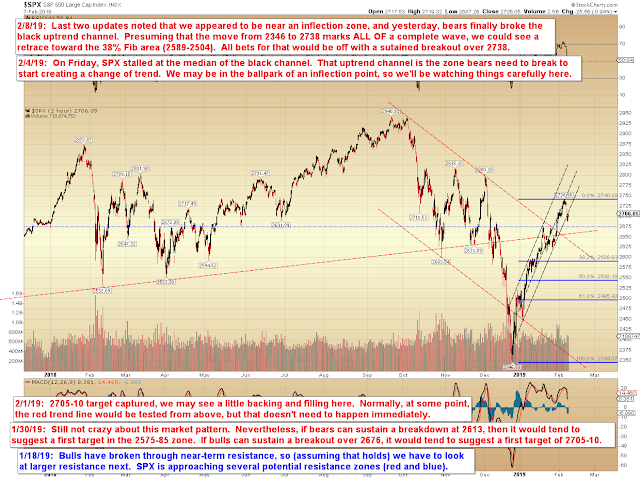 The last couple updates noted that we appeared to be approaching an inflection zone. On Friday, I had noted that another wave up might be needed, and we did get a new high after that update -- and that may finally mark a complete wave off the December lows. Bears, of course, want to hold the breakdown of the black channel against retests; bulls tested the channel at the close yesterday, and so far that test has been rejected. Sometimes the market likes to create a second test of such channels, but I'm not sure if it will do so here or not. In conclusion, presuming bears can make this breakdown stick, SPX may take aim at the 38% Fib retracement. If it does, we'll see how it looks from there and decide in real-time if it looks pointed lower (toward the 50% or 62%). Obviously, if it sustains a breakout over this month's high, then all bear bets are off. Trade safe.